Flashpoint 3 Kit. Three stands, three umbrellas, three sockets, three bulbs. Stepping up to a versatile artificial lighting setup is often a big financial leap for many photographers. But Adorama has just introduced an inexpensive hot light kit that's surprisingly comprehensive with three stands and three umbrellas. And it uses fluorescent bulbs. Unlike expensive monobloc or strobe lighting kits, a hot light kit illuminates the scene continuously so you can see what you're doing. Incandescent hot lights, however, tend to be uncomfortably hot for living subjects. LED panels like the Flashpoint 500 are a cool but expensive solution. And while fluorescents aren't as cool as LEDs, they aren't quite as hot as incandescents. Adorama notes that the 45-watt bulb is the equivalent output of a 225-watt incandescent while the 30-watt bulb is the equivalent of a 150-watt incandescent. Color temperature is 5000 to 5600 Kelvin (let them warm up a bit). Replacement bulbs are $6 for the 45-watt bulb and $4 for the 30-watt bulb. Both models fit a standard household socket. NEW YORK, N.Y. -- Adorama, one of the world's largest photography, imaging, video and electronics retailers and a leading destination for iPhone photo specialty accessories, has begun selling the Flashpoint 3 Lighting Kit with Light Stands, 3-33" Umbrellas, Socket, Bulbs & Case. Designed with photographers in mind, the Lighting Kit's fluorescent lighting system is the perfect kit for all complex lighting needs. Easily customize the lighting setup by adding diffusers for a softer effect or collapsible reflectors to alter the quality of the light. All pieces break down easily for storage in the included case. Whether shooting in the studio or on location, the Flashpoint 3 Lighting Kit is ready for anything. The Lighting Kit makes for a great on-the-go commodity that you won't want to leave home without. It gives the photographer plenty of lighting choices while on a shoot. For those in need of some inspiration to jumpstart a photo shoot with the new Lighting Kit, check out Joe McNally's "The Secret to Shooting Dramatic Flash-Lit Portrait Photography That Looks Like Natural Daylight" for some tips and tricks. 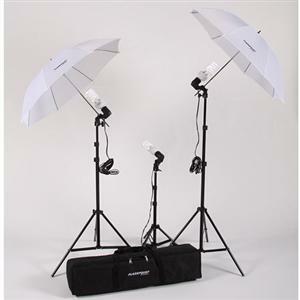 Flashpoint 3 Lighting Kit with Light Stands, three 33" Umbrellas, Socket, Bulbs & Case retails at the special rebate price of $64.95 (regularly $84.52). It is available online at http://www.adorama.com or at the Adorama superstore located at 42 West 18th Street New York, NY 10011. Flashpoint is Adorama's in-house brand, featuring high quality photo and video accessories and gear, such as the Flashpoint 3 Lighting Kit, at price points lower than competing name brands like Interfit and Smith Victor.